Float like a butterfly, sting like a... caterpillar? When a retired biology professor is found dead in his apartment from an apparent caterpillar bite, the death is initially considered an accident, until new evidence puts it firmly in 'homicide' territory. Unfortunately for Sapphire Village, the oh-so-gorgeous police chief, Chase Griffin, is out of action after a freak accident while teaching Alice Calliope how to ski. Feeling guilty about her role in the accident, Alice decides to find the murderer herself. After all, she's done it twice before. How hard could solving a third murder be? Quickly finding herself mired in a world of academia and cheating, Alice starts to question her wisdom in getting involved in the case. 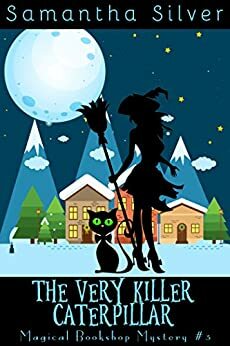 On top of all that, she has to deal with her evolving feelings for Chase and her own unresolved relationship issues, and when the Others make another appearance she and Cat decide they need to go on the offensive against the nasty creatures. Will Alice be able to bring another murderer to justice, come to grip with her past and keep her cousin safe, or has she bitten off more than she can chew this time? The Very Killer Caterpillar is a full-length novel and the third book in the Magical Bookshop Mystery series of paranormal cozy mysteries. Another enjoyable time spent with Alice and her family. I like having a ghost in residence at the bookstore. Looking forward to the next books in this wonderful series. Great job. Alice and her cousins get into trouble and take it on with humor and sass! Can't wait for the next one! I love the Paranormal Cozy Mysteries, they are fun and thrilling at the same time. Samantha Silver is an excellent storyteller.